This month, the Bundt-a-Month group founders, Anuradha of Baker Street and Lora of Cake Duchess, chose cherry as our theme and my mind immediately drifted to warm weather thoughts. I love spring and summer and the appearance of the first, sweet cherries in the market makes me very, very happy. Unfortunately, we've had a horribly cold winter and it doesn't seem to want to let go. No fresh cherries yet. Hmm. Well, as much as I love fresh cherries, I should be able to make a cherry dessert even when the weather doesn't cooperate. My first thought was frozen cherries but my market didn't have any. Then I bought a jar of fancy cherry preserves but I wasn't happy with either the taste or consistency. It tasted like some kind of sweet fruit and was fine on our morning toast but not good enough for a cherry cake. Canned cherry pie filling? I'd never actually tried that stuff but was very pleasantly surprised. I knew I'd have to get rid of most of the "glop" that's in the can because I didn't want to make my cake too wet. But the actual cooked cherries tasted great and they held up perfectly in the cake. I debated making a chocolate bundt since chocolate and cherry are such a classic combination but my spring/summer brain demanded something lighter. 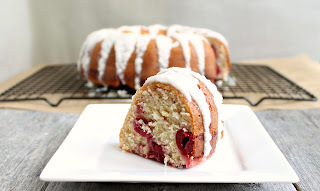 Lots of fresh lemon zest in the cake and a lemony glaze over top went so perfectly with the cherries. The weather may not be cooperating but this cake was like a slice of summer on a plate. Enjoy! Empty the can of cherry pie filling into a bowl and, with a spoon, remove the actual cherries from the filling mixture. It's OK if some of it still clings to the cherries. Preheat the oven to 350 degrees and butter and flour a 12 cup bundt pan. In a bowl, combine the flour, baking powder, baking soda and salt. In a separate bowl, beat together the butter, sugar, eggs and vanilla. When that has been creamed, add in the sour cream and lemon zest and beat until combined. Working in batches, add in the flour mixture until everything is combined. Pour the batter into the bundt pan and spoon the cherries over the top. Using a spoon or butter knife, swirl the cherries slightly into the batter. Bake in the pre-heated oven for approximately 50 minutes or until a cake tester comes out clean. Allow the cake to cool thoroughly before turning it out of the pan. While the cake is cooling, make the glaze by adding the milk and melted butter to a bowl. Whisk in the confectioner's sugar until it's fully incorporated and stir in the lemon juice and salt. When the cake has been removed from the pan, drizzle on the glaze. Makes approximately 10 servings. Want to join us and be part of Bundt-a-Month? - Follow Bundt-a-Month on Facebook at http://www.facebook.com/BundtaMonth where we feature all our gorgeous bundt cakes. Or head over to - our Pinterest board at https://pinterest.com/bakerstreet/bundtamonth/ for inspiration. Gorgeous, Anita. You are one of the select few who can actually turn a can of cherry pie filling into something extraordinarily elegant. Bravo! Oh wait, there's cherries in there. gahhh i love cherries! This bundt sounds right up my alley :) and what a fun idea for a group. Yum! Sounds like the perfect flavor combination. Excellent choice of the lemon to go with the cherries. It does make it right for spring. I'd love to have a slice right now. Love the combination of lemons and cherries... Those red speckles from the cherries looks beautiful! Such a beautiful bundt! I love the flavors you added to this cake, Anita. It just oozes spring! Ooh, summer on a plate! I can taste the sunshine now, Anita. Beautifully done! Mmm cherries. Love your innovation of the canned pie filling and fishing out the cherries! Is it spring yet? Secretly, I LOVE canned cherry pie filling! Lemon in just about anything is fabulous so this is tops on my list! I have already pinned it and I think I shall make this for mom's next red hat bunco-playing affair. Gorgeous Bundt, Anita. I never would have thought to use cherry pie filling, but it worked beautifully! 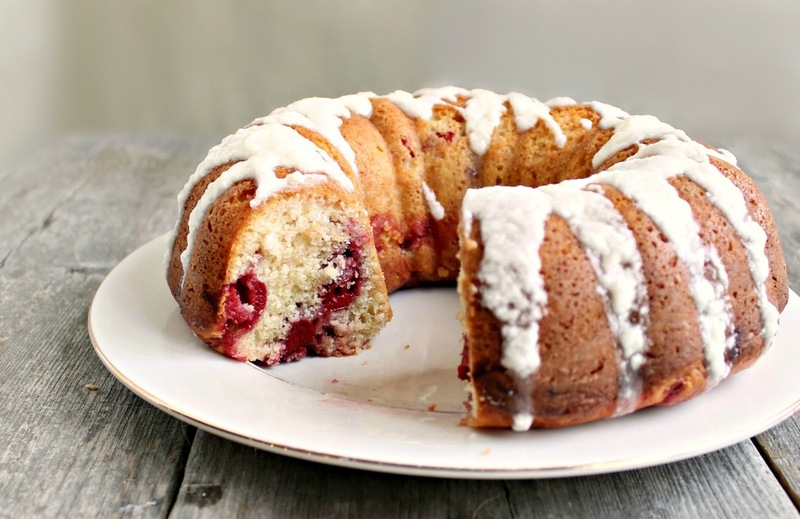 I think you did a lovely job with your bundt and the cherry pie filling. The lemon adds a nice fresh and springy touch to it. I can't wait either to get some delicious fresh cherries at our market (I couldn't find frozen ones either and opted w/the dried ones;)Thanks for being a part of our #BundtaMonth gorup, Anita! Great job, Anita!! I love the lemon & cherry combo! 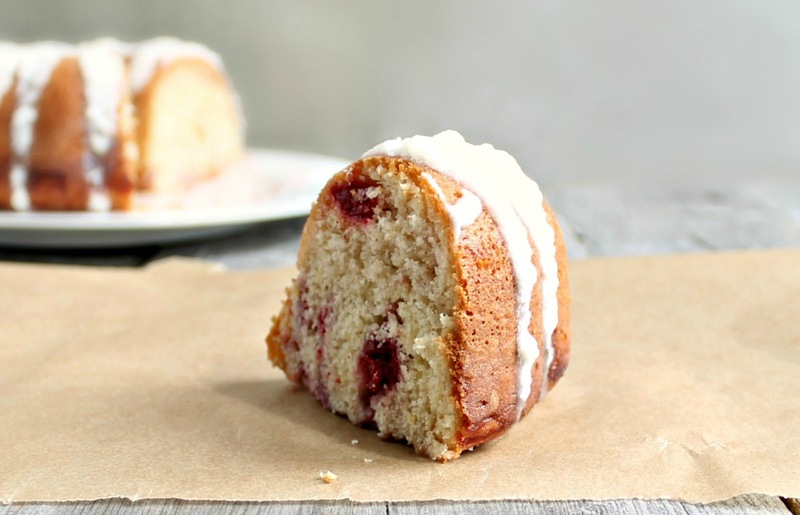 Makes for a moist and delish bundt cake! Anita! That bundt is SO gorgeous! I love all things lemon and cherry. I'm ALLLL over this idea! I love that you put lemon in the cake and on the cake. what a wonderful combination. Yay lemon and cherries! Great combination idea. And perfect use of pie filling Anita. It´s a gorgeous bundt! I love it! Pie filling in a bundt cake! Yummers! Brilliant job on using canned cherry filling here, Anita. I would've never known from looking at your beautiful photos of that perfect bundt cake. Lemon and cherry together totally puts me in a springtime mood. I hope the weather gets better for you soon! Love the lemony direction your thoughts took you. Yum! Love the lemon cherry combination, Anita! Maybe this beautiful cake will bring on warmer weather! It looks divine Anita! Cherry and lemon is a perfect match together. I never thought to pair lemon with cherries but that sounds so good! I love all the bundt cakes everyone shares, but this one grabbed my attention immediately - such a pretty, moist combination of wonderful flavors. Perfect for Spring! Oh Anita, this looks to die for! This cake looks beyond delicious. I love all the spring flavors going on. Yum! I love lemons and along with the cherries, I imagine the combination is a lovely one. I've recently joined the #bundtamonth group and the Cherry Rocky Road bundt is my month's entry. Is the glaze supposed to look curdled? What is the texture like? I made this foe my cake and it curdled as soon as I stirred in the lemon juice. Did do something wrong? Hi Jodib - I'm sorry you had trouble with the glaze. I think it's possible you may not have stirred it long enough. Mine also looked curdled at first and then settled down. If you still have trouble, try adding more powdered sugar and that should help the consistency. I hope that helps. This is my all-time favorite cake. It's heavenly.